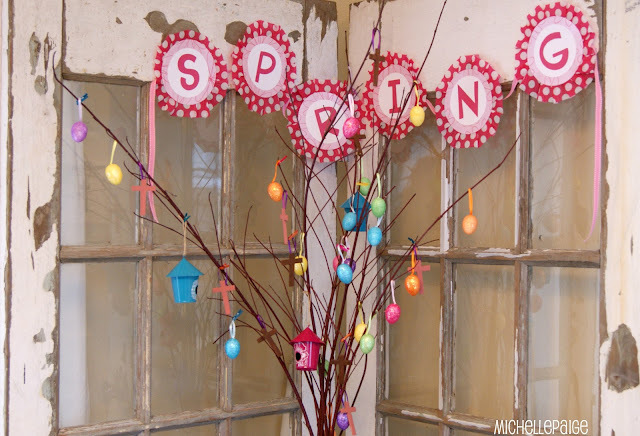 I'm talking about Easter Trees today! On our tree, we added sparkly eggs, painted crosses and mini birdhouses. Quick, inexpensive, yet colorful Easter decor...however, I think it's lacking something. 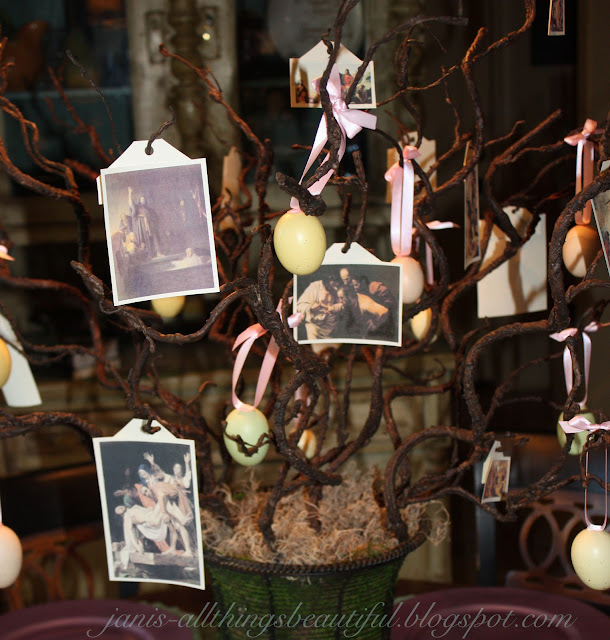 Here's a few more Easter trees to look at for inspiration. 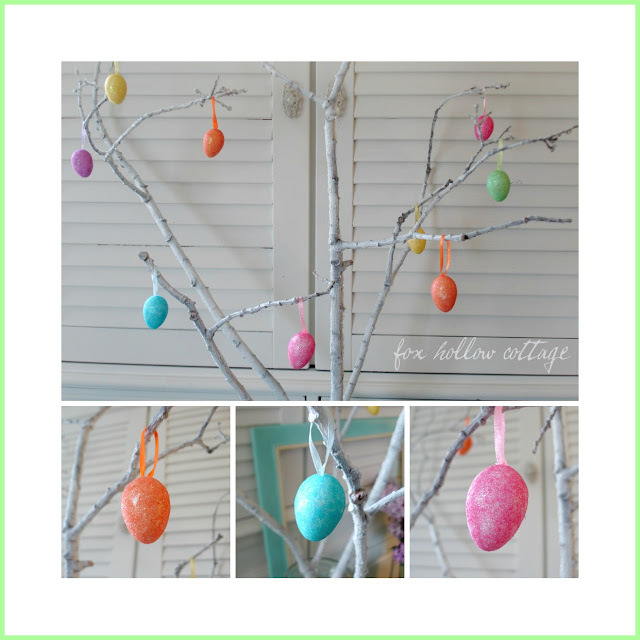 Check out this yarn wrapped Easter Egg Tree from One Charming Party. Fox Hollow Cottage made this sweet Easter Egg Tree for $2. Yes, $2! I love how she spray painted her branches white. Making It Feel Like Home shows you (step-by-step) how to make an Easter Tree. 52 Mantels made an Easter Tree with patterned paper leaves. This tree could stay out all year long! How fun! Homespun with Love made this Symbolic Easter Tree. Apparently, the Easter Tree tradition came from Germany. Cottage in the Oaks made this Easter Passion Tree. Visit her site for more information on making a tree that tells the story of Christ. All Things Beautiful made a Jesus Easter Tree, too. I've got this on my things to do next Easter! Marisa's Pieces crafted this sweet Easter Tree in a pot. I love the ribbon tied on the branches. Hey... I'm thinking MY tree needs some festive Easter ribbon? Yes??? 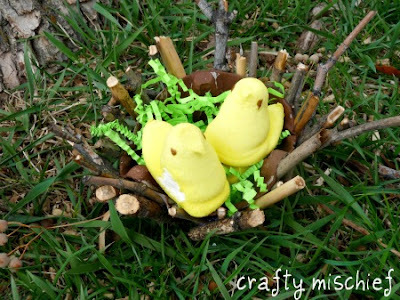 Crafty Mischief made these nests from a drive thru cup holder. So clever. I wonder if there's anything else I should add? Want to check out some more tree ideas from past seasons? Click here. 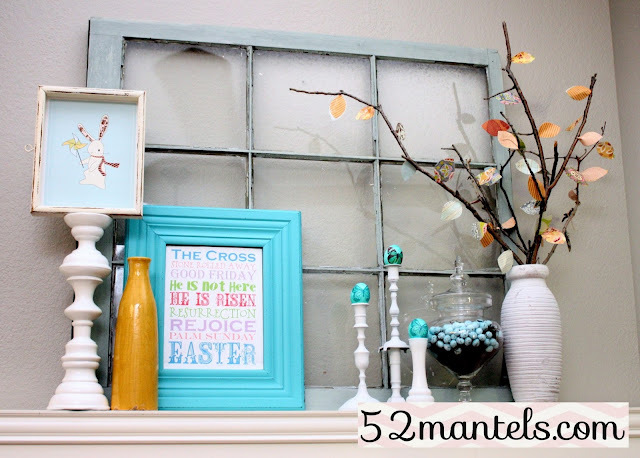 And remember...there's lots of Easter inspiration at my Springtime Holiday Link Party! Beautiful collection of Easter trees, Michelle! Thanks for including ours! My hubby had the idea to print extra copies of the pictures. So, last week I taped them to the backs of the pics I had already hanging. Now they are double sided! We don't see any blank backs, just the beautiful pictures that tell Jesus' story. Why didn't I think of that?? Thanks for the feature, Michell! :) Easter Blessings to you and your family. Hi Michelle! Thanks for adding my Easter Tree in with all those pretty versions. Thanks so much for featuring me, Michelle!! Such a sweet surprise! Thanks for featuring my nest Michelle! I love all the pretty trees too! Happy Easter!